Misty was the most beautiful dog I have ever met. 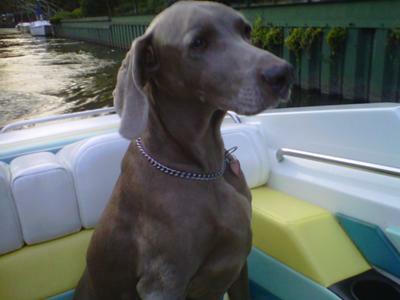 She was a very elegant Weimaraner who loved her walks, was a picky eater and blessed us with a long life of 14 years. She had a great personality and was so easy to love. She was my best friend in the entire world. 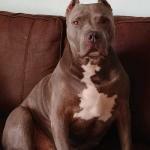 Misty was diagnosed with lung cancer in early December 2010. On December 23rd, we had to make the decision to let her go. I will never forget the look and the stare from her the moment before the vet took over. It has been about a month and my heart is empty. I think about her a million times a day. Sometimes I wonder if I will ever actually heal. I am grateful for knowing and loving her but I can't wait to see her again. Thank God for this website. So many people around the world are hurting because they've lost their pet loves. Misty is truly an elegant-looker. Think of all the great times you had with her and she had with you. As time passes, it will feel a little less sad. That saying, "Time Heals" really is true. The pain in your heart will subside one day. Remember, it is healthy to grieve for the loss of your loved one. It is natural. Nothing is wrong with you. We are all grieving for our own loss. My German Shepherd died last Sunday (26th June) and I feel I can't go on living. I am crying all the time as I miss him and his smile and all the patting he used to get and all the ball-playing on the back lawn. The list is endless but I know that with time, I'll get over him and it is OK to cry. I'm sorry to read about Misty. She will always love, love, love you and you will always love and cherish the good times you had. Time will help you heal and she will always be in your heart. What a great dog Misty was. Not only were you lucky to have her, she was so lucky to have YOU! She was so easy to love and care for, she would want you to be happy. So smile and remember all the funny things she did and feel comfort in knowing that you were her best friend too! I know how you feel. I think my heart is still breaking. Take care of you. Misty thought you were wonderful! !